Lease Analysts being representative of a bank or financial institution or corporate, act as a mediator between the parties involved in the lease agreement. They ensure that the lesser, as well as lessee, understand the terms and conditions of the lease agreement. 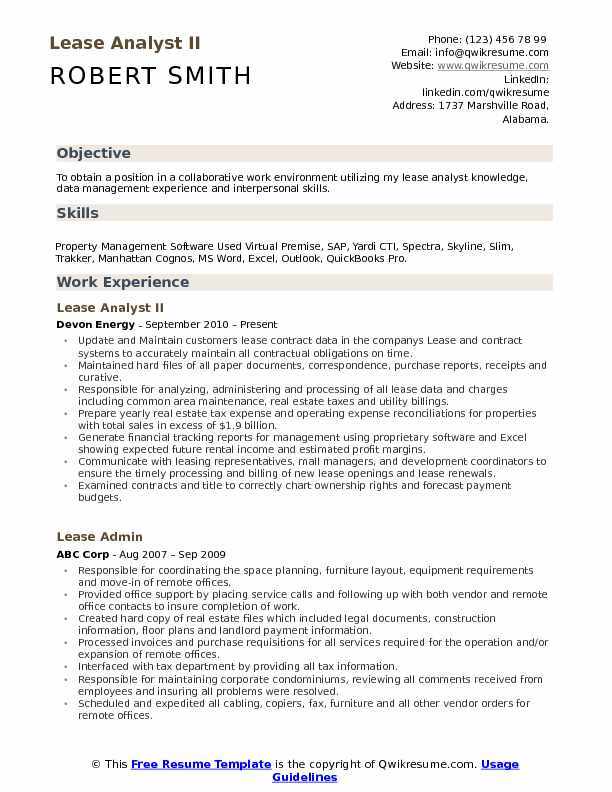 The Lease Analyst Resume should showcase skills related to knowledge of lease contracts, contract negotiation, lease documentation, taxation, and accounting transactions, attention to details, analytical thinking, strong communication, and computer competency. A professional qualification of degree or diploma in the faculties of banking, mathematics or accounts would receive preference from the employer. Lease Analysts with their expertise in lease documentation protect the interests of both the parties by giving a clear understanding of the agreement, reminding on the renewal of the lease and maintaining their records. 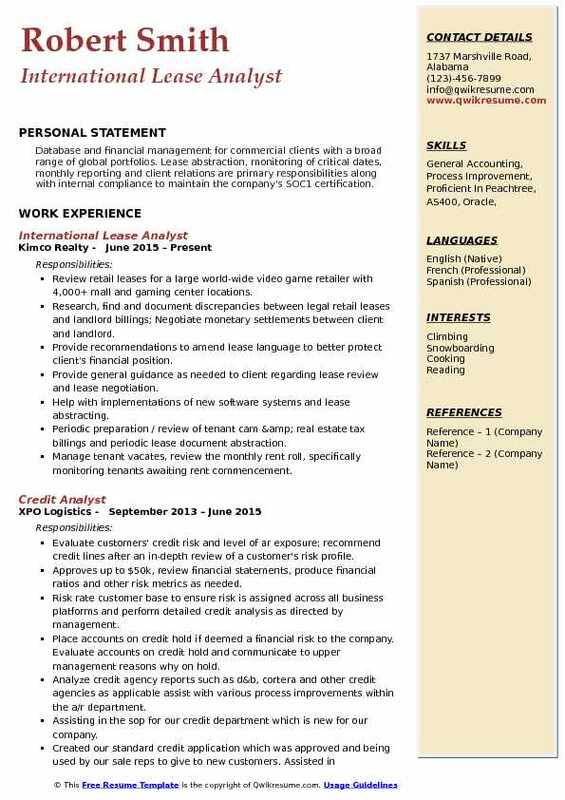 Headline : To obtain a position in a collaborative work environment utilizing my lease analyst knowledge, data management experience and interpersonal skills. Skills : Property Management Software Used Virtual Premise, SAP, Yardi CTI, Spectra, Skyline, Slim, Trakker, Manhattan Cognos, MS Word, Excel, Outlook, QuickBooks Pro. Update and Maintain customers lease contract data in the companys Lease and contract systems to accurately maintain all contractual obligations on time. Maintained hard files of all paper documents, correspondence, purchase reports, receipts and curative. 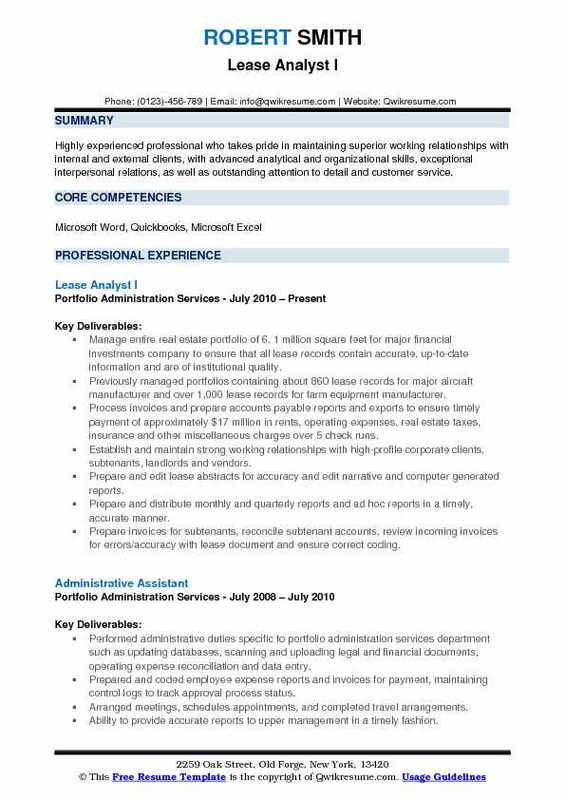 Responsible for analyzing, administering and processing of all lease data and charges including common area maintenance, real estate taxes and utility billings. Prepare yearly real estate tax expense and operating expense reconciliations for properties with total sales in excess of $1.9 billion. Generate financial tracking reports for management using proprietary software and Excel showing expected future rental income and estimated profit margins. Communicate with leasing representatives, mall managers, and development coordinators to ensure the timely processing and billing of new lease openings and lease renewals. Examined contracts and title to correctly chart ownership rights and forecast payment budgets. Reconciled data from multiple sources during devons permian/silver city acquisition of over 2,000 leases. 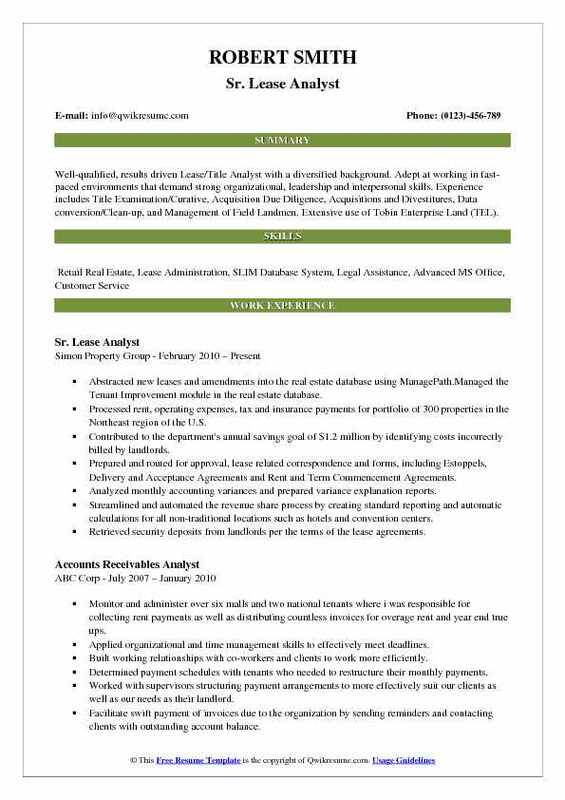 Summary : Highly experienced professional who takes pride in maintaining superior working relationships with internal and external clients, with advanced analytical and organizational skills, exceptional interpersonal relations, as well as outstanding attention to detail and customer service. Manage entire real estate portfolio of 6. 1 million square feet for major financial investments company to ensure that all lease records contain accurate, up-to-date information and are of institutional quality. Previously managed portfolios containing about 860 lease records for major aircraft manufacturer and over 1,000 lease records for farm equipment manufacturer. Process invoices and prepare accounts payable reports and exports to ensure timely payment of approximately $17 million in rents, operating expenses, real estate taxes, insurance and other miscellaneous charges over 5 check runs. Establish and maintain strong working relationships with high-profile corporate clients, subtenants, landlords and vendors. Prepare and edit lease abstracts for accuracy and edit narrative and computer generated reports. Prepare and distribute monthly and quarterly reports and ad hoc reports in a timely, accurate manner. Prepare invoices for subtenants, reconcile subtenant accounts, review incoming invoices for errors/accuracy with lease document and ensure correct coding. 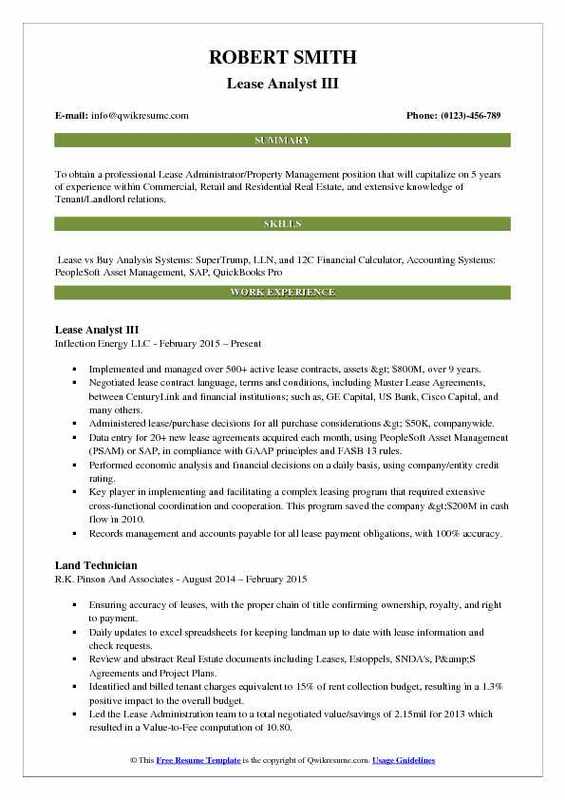 Summary : Well-qualified, results driven Lease/Title Analyst with a diversified background. Adept at working in fast-paced environments that demand strong organizational, leadership and interpersonal skills. 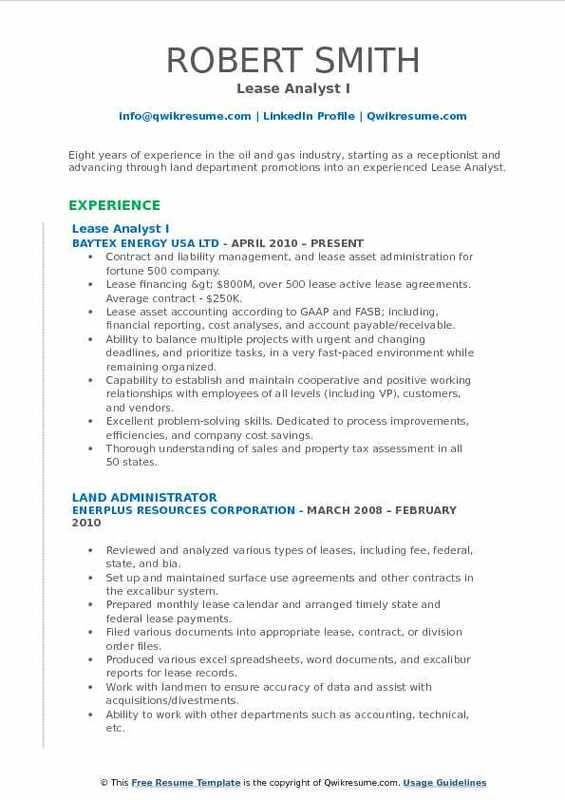 Experience includes Title Examination/Curative, Acquisition Due Diligence, Acquisitions and Divestitures, Data conversion/Clean-up, and Management of Field Landmen. Extensive use of Tobin Enterprise Land (TEL). Abstracted new leases and amendments into the real estate database using ManagePath.Managed the Tenant Improvement module in the real estate database. Processed rent, operating expenses, tax and insurance payments for portfolio of 300 properties in the Northeast region of the U.S. Contributed to the department's annual savings goal of $1.2 million by identifying costs incorrectly billed by landlords. Prepared and routed for approval, lease related correspondence and forms, including Estoppels, Delivery and Acceptance Agreements and Rent and Term Commencement Agreements. Analyzed monthly accounting variances and prepared variance explanation reports. Streamlined and automated the revenue share process by creating standard reporting and automatic calculations for all non-traditional locations such as hotels and convention centers. Retrieved security deposits from landlords per the terms of the lease agreements. 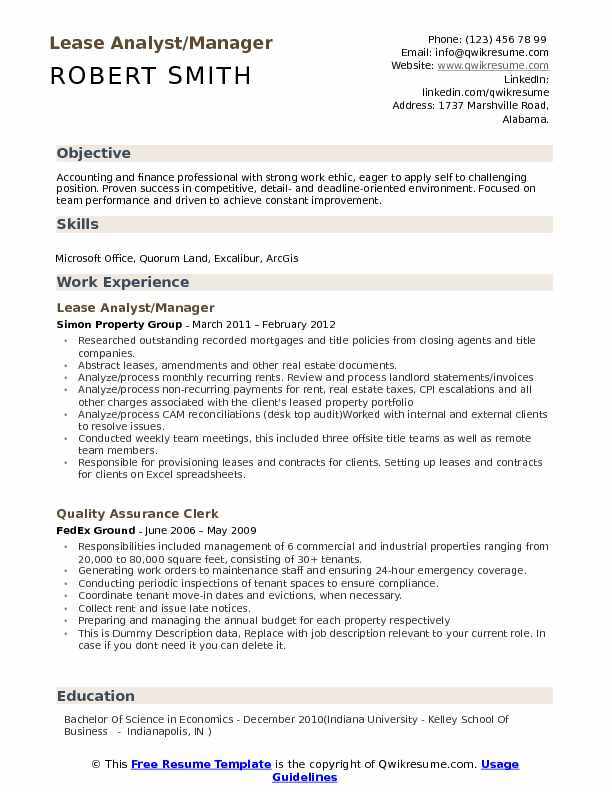 Summary : A highly motivated individual possessing leadership skills as shown in officer positions in an honors fraternity and Toastmasters International, an above-average academic record, certified as a Registered Landman, a solid work ethic, proficient in Microsoft Office, experience with Quorum and One Site, familiarity with report creation and a strong moral compass. Analyze leases, contracts, title opinions, curative documentation, regulatory, and other well information. Set-up and review of lease payments, division of interests, and owners. Process and update records according to transfers, deals, expirations, and other lease obligations. Work closely with Division Orders, Land, Legal, and other departments to ensure accuracy and legal compliance. Knowledge of Indian and Federal leases, payments, and processes. Facilitate training to new and experienced analysts, as well as others outside of the Land Administration department. Maintain the status of leases and ensure what has expired or been extended is updated in the land management system; est. 15,000 leases. 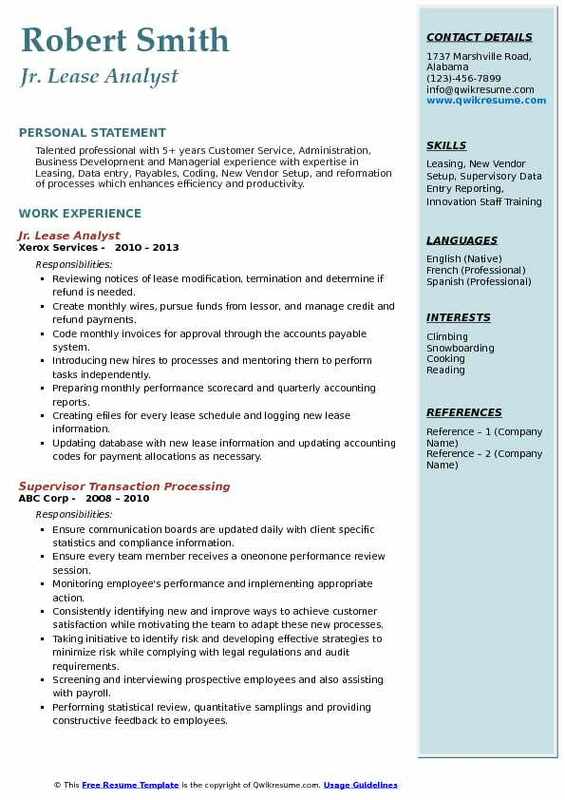 Summary : Talented professional with 5+ years Customer Service, Administration, Business Development and Managerial experience with expertise in Leasing, Data entry, Payables, Coding, New Vendor Setup, and reformation of processes which enhances efficiency and productivity. Reviewing notices of lease modification, termination and determine if refund is needed. Create monthly wires, pursue funds from lessor, and manage credit and refund payments. Code monthly invoices for approval through the accounts payable system. Introducing new hires to processes and mentoring them to perform tasks independently. Preparing monthly performance scorecard and quarterly accounting reports. Creating efiles for every lease schedule and logging new lease information. Updating database with new lease information and updating accounting codes for payment allocations as necessary. 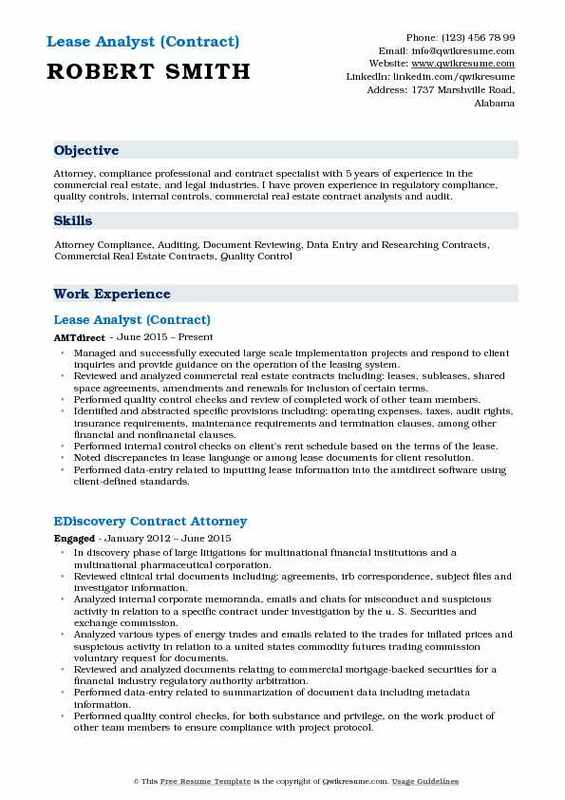 Objective : Attorney, compliance professional and contract specialist with 5 years of experience in the commercial real estate, and legal industries. I have proven experience in regulatory compliance, quality controls, internal controls, commercial real estate contract analysis and audit. Managed and successfully executed large scale implementation projects and respond to client inquiries and provide guidance on the operation of the leasing system. Reviewed and analyzed commercial real estate contracts including: leases, subleases, shared space agreements, amendments and renewals for inclusion of certain terms. Performed quality control checks and review of completed work of other team members. Identified and abstracted specific provisions including: operating expenses, taxes, audit rights, insurance requirements, maintenance requirements and termination clauses, among other financial and nonfinancial clauses. Performed internal control checks on client's rent schedule based on the terms of the lease. Noted discrepancies in lease language or among lease documents for client resolution. Performed data-entry related to inputting lease information into the amtdirect software using client-defined standards. Objective : Motivated and enthusiastic commercial real estate professional eager to join a growing company to aid in my professional development. Experience in brokerage, client relations, marketing and accounting with the ability to comprehend and communicate complex and technical concepts. 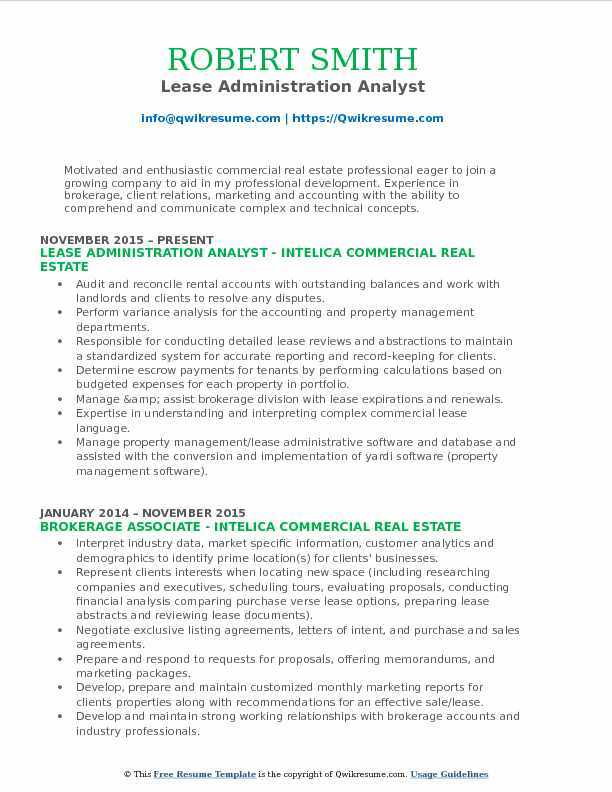 Skills : Real Estate, Yardi, Property Management, Argus Software, Skyline, ProLease, Commercial Real Estate Documents, Leasing and Sales Process. Audit and reconcile rental accounts with outstanding balances and work with landlords and clients to resolve any disputes. Perform variance analysis for the accounting and property management departments. Responsible for conducting detailed lease reviews and abstractions to maintain a standardized system for accurate reporting and record-keeping for clients. Determine escrow payments for tenants by performing calculations based on budgeted expenses for each property in portfolio. Manage & assist brokerage division with lease expirations and renewals. Expertise in understanding and interpreting complex commercial lease language. Manage property management/lease administrative software and database and assisted with the conversion and implementation of yardi software (property management software). Summary : Well regarded Executive Administrative Professional with extensive experience in a wide range of businesses, including real estate, legal, medical, accounting, and public education. A highly motivated contributor with proven performance of accuracy and attention to detail. Analyzed lease expenses and processed monthly rent for 75-100 stores with an annual operating budget of $2.2m. Achieved annual cost savings of $907k (30% of department total) through successful negotiations with landlords to revise their billings based on non-compliance with lease language, often resulting in amendments to the lease. Implemented initial input of critical information including dates and dollars into slim system for fasb requirements, as well as ongoing lease modifications. Ensured compliance with sox requirements interacting with accounting and financial departments. Tracked critical dates for delivery of space and opening of 85 stores annually and interacted with store planning, construction and stores administration departments. Verified initial lease compliance for co-tenancy and other relevant lease obligations. Performed paralegal work including interpretation of lease and related documents and preparing lease abstracts, reviewing sndas and estoppels, drafting amendments, and exercising options. Headline : Database and financial management for commercial clients with a broad range of global portfolios. Lease abstraction, monitoring of critical dates, monthly reporting and client relations are primary responsibilities along with internal compliance to maintain the company's SOC1 certification. Review retail leases for a large world-wide video game retailer with 4,000+ mall and gaming center locations. Research, find and document discrepancies between legal retail leases and landlord billings; Negotiate monetary settlements between client and landlord. Provide recommendations to amend lease language to better protect client's financial position. Provide general guidance as needed to client regarding lease review and lease negotiation. Help with implementations of new software systems and lease abstracting. Periodic preparation / review of tenant cam & real estate tax billings and periodic lease document abstraction. Manage tenant vacates, review the monthly rent roll, specifically monitoring tenants awaiting rent commencement. Objective : Possess strong organizational, detail orientation, verbal and written communication and interpersonal skills. Works well independently with indirect supervision and in a team-based environment Able to build and maintain business relationships with people on all levels. Responsible for reading numerous types of lease documentation and abstract critical terms, conditions and provisions. Responsible for setting up lease administration procedures and guidelines. Responsible for monitoring and managing move-in and move-out dates and deadlines. Manage communications with vendors, contractors, etc. To ensure utilities, hardware and software are delivered and retrieved in a timely fashion. Review financials of assigned property portfolio including: expense and revenue, ap, ar, cash, and consolidated monthly financial statements. Responsible for participating in portfolio review meetings to stay up-to-date with anticipated expirations. Analyzes estate documentation, intestacy statutes, deeds, assignments, and conveyances to perform ownership transfers and/or advises owners of required documentation. 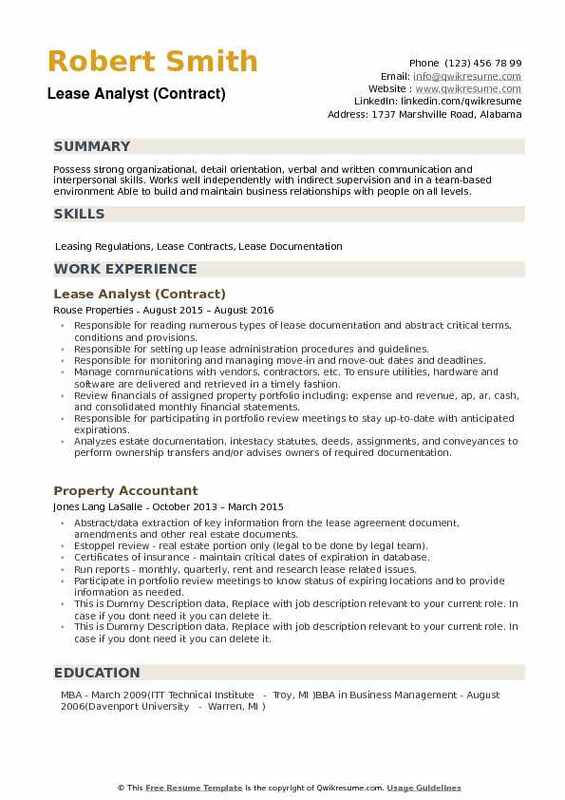 Summary : Accounting and finance professional with strong work ethic, eager to apply self to challenging position. Proven success in competitive, detail- and deadline-oriented environment. Focused on team performance and driven to achieve constant improvement. Researched outstanding recorded mortgages and title policies from closing agents and title companies. Abstract leases, amendments and other real estate documents. Analyze/process CAM reconciliations (desk top audit)Worked with internal and external clients to resolve issues. Conducted weekly team meetings, this included three offsite title teams as well as remote team members. Responsible for provisioning leases and contracts for clients. Setting up leases and contracts for clients on Excel spreadsheets. 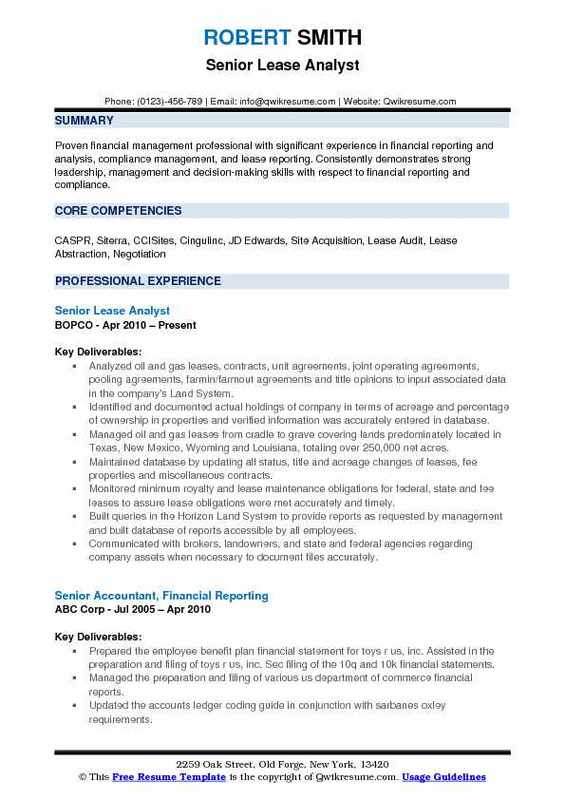 Summary : Proven financial management professional with significant experience in financial reporting and analysis, compliance management, and lease reporting. Consistently demonstrates strong leadership, management and decision-making skills with respect to financial reporting and compliance. Analyzed oil and gas leases, contracts, unit agreements, joint operating agreements, pooling agreements, farmin/farmout agreements and title opinions to input associated data in the company's Land System. Identified and documented actual holdings of company in terms of acreage and percentage of ownership in properties and verified information was accurately entered in database. Managed oil and gas leases from cradle to grave covering lands predominately located in Texas, New Mexico, Wyoming and Louisiana, totaling over 250,000 net acres. Maintained database by updating all status, title and acreage changes of leases, fee properties and miscellaneous contracts. Monitored minimum royalty and lease maintenance obligations for federal, state and fee leases to assure lease obligations were met accurately and timely. Built queries in the Horizon Land System to provide reports as requested by management and built database of reports accessible by all employees. Communicated with brokers, landowners, and state and federal agencies regarding company assets when necessary to document files accurately. 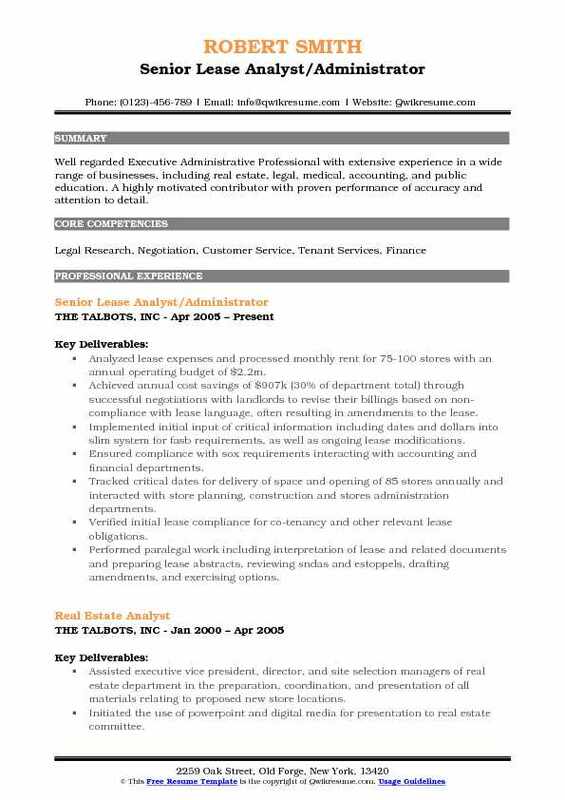 Headline : To obtain a professional Lease Administrator/Property Management position that will capitalize on 5 years of experience within Commercial, Retail and Residential Real Estate, and extensive knowledge of Tenant/Landlord relations. Implemented and managed over 500+ active lease contracts, assets > $800M, over 9 years. Negotiated lease contract language, terms and conditions, including Master Lease Agreements, between CenturyLink and financial institutions; such as, GE Capital, US Bank, Cisco Capital, and many others. Administered lease/purchase decisions for all purchase considerations > $50K, companywide. Data entry for 20+ new lease agreements acquired each month, using PeopleSoft Asset Management (PSAM) or SAP, in compliance with GAAP principles and FASB 13 rules. Performed economic analysis and financial decisions on a daily basis, using company/entity credit rating. Key player in implementing and facilitating a complex leasing program that required extensive cross-functional coordination and cooperation. This program saved the company >$200M in cash flow in 2010. Records management and accounts payable for all lease payment obligations, with 100% accuracy. 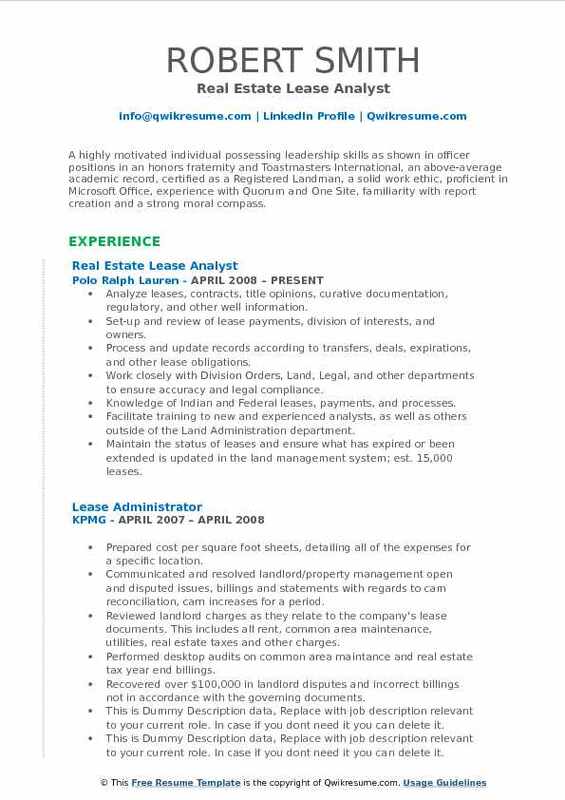 Summary : Eight years of experience in the oil and gas industry, starting as a receptionist and advancing through land department promotions into an experienced Lease Analyst. Contract and liability management, and lease asset administration for fortune 500 company. Lease financing > $800M, over 500 lease active lease agreements. Average contract - $250K. Lease asset accounting according to GAAP and FASB; including, financial reporting, cost analyses, and account payable/receivable. Ability to balance multiple projects with urgent and changing deadlines, and prioritize tasks, in a very fast-paced environment while remaining organized. Capability to establish and maintain cooperative and positive working relationships with employees of all levels (including VP), customers, and vendors. Excellent problem-solving skills. Dedicated to process improvements, efficiencies, and company cost savings. Thorough understanding of sales and property tax assessment in all 50 states.